Science on the Move has been a terrific asset to my classroom instruction. 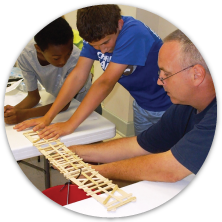 The hands-on programs are perfect for supplementing our current curriculum and the students have enjoyed them as well as learned far more than they could have from a book. Robin and Katie are extremely professional and go the extra mile to accommodate and assist in any way possible to make the experience seamless. I appreciate everyone that has made this opportunity possible for my students.